This article is about Lucario's appearance in Super Smash Bros. Brawl. For this Pokémon in other contexts, see Lucario. Lucario (ルカリオ, Lucario) is an unlockable character in Super Smash Bros. Brawl, originating from the Pokémon universe. Confirmation of Lucario's inclusion in Brawl was leaked before the game's release through a promotional video on the Japanese Wii website about sticker power ups. It was officially revealed on February 28th, 2008. Lucario is voiced by Daisuke Namikawa in the Japanese version, and by Bill Rogers in the English version. Lucario is currently ranked 11th on the tier list, placing it at the top of the C+ tier. Lucario is most known for its Aura property that increases its power as its damage goes up and is bolstered even further when its placing falls in a match. At high percentages, Lucario possesses KO power that rivals that of Bowser and Ganondorf, while its attacks are much faster. Outside of aura, Lucario possesses what is considered one of the strongest aerial games, with its above average air speed and floaty falling speed giving it strong aerial movement, while its amazing and well balanced aerial attacks give it some of the best offensive and defensive aerial capabilities. Lucario additionally possesses a strong defensive game to bolster its aura property farther, possessing good movement, great reach, a strong and spammable projectile in Aura Sphere, and extremely fast and long distanced rolls. Lucario also has one of the strongest comboing abilities in Brawl, possessing several effective combo starters and attacks that flow into each other well, as well as a strong grab and throw game. Lucario's Aura property acts as a double-edged sword however, as its attacks are extremely weak at low damage percents. Since Lucario lacks an effective gimping move and has only a few moves that aren't affected by Aura (none of which are reliable KO moves), Lucario has to be at high damage percentages to KO effectively, where it is then vulnerable to KOs itself. Lucario, despite possessing a good recovery, can be problematic; even though Lucario can cover good distance when recovering and its recovery move ExtremeSpeed is versatile with unique properties, ExtremeSpeed lacks invincibility frames and damaging hitboxes while also not being very fast. This makes ExtremeSpeed heavily vulnerable to edge-hogging and makes Lucario one of the easier characters to edge-guard. Overall, Lucario has strong matchups, with only two countered matchups against Meta Knight and King Dedede, and it has achieved strong tournament results. Complete Target Smash!! on all difficulty levels with one character (2 player mode also counts). Have Lucario join the player's party in the Subspace Emissary (The Glacial Peak). With the exception of the third method, the player must then defeat Lucario on Spear Pillar in order to unlock it. Lucario is a character with relatively fast attack speed and decent maneuverability. It has a very strong air game due to the speed and knockback of its aerials; its forward and up airs are great for juggling and stringing into each other at low percents, the forward air is also useful as a defensive move and general combo-filler, and its down air has very fast start-up and strong edge-guarding ability. Lucario's aerials in general give it a good set of approaching and defensive moves, due to having floaty physics, decent air speed, and the ability to wall jump and wall cling. Lucario's recovery move ExtremeSpeed is bendable, allowing a variety of unpredictable recovery angles, and the ability to wall cling and wall jump after use. Most of Lucario's attacks have unexpectedly large hitboxes, most notably its forward smash. Of course, Lucario's biggest advantage is its aura. A Lucario at KO percent gains enough extra damage on its attacks to reduce the opponent's survivability by a few dozen percent, in addition to increasing the already-large hitbox size of most of its moves. Aura also increases Lucario's power when it is behind in the match; both these factors combined allow it more chance to stage a comeback than some other characters. Other tools include Aura Sphere, a multi-purpose projectile that can bother approaches or KO at high percents (for both players). While Lucario's floatiness gives it control in the air, it does leave it susceptible to juggling despite its down aerial's momentum-halting properties. Most of its ground attacks are also on the slow side, and its ground speed is slightly below average (although it does have a fast fox-trot), so it must use its aerials to keep the opponent out of close range. But the biggest problem is that aura is a two-way street; when at low damage (such as at the start of every stock) Lucario's entire moveset is weakened, and when it has a lead in stocks its power decreases even further, which makes it difficult to make headway on the opponent at the start of a match and can make it harder to hold a lead than some other characters. The reduced damage also comes with reduced power, meaning Lucario has a hard time getting KOs until its damage reaches a certain amount. It also lacks a meteor smash outside of Footstool Jumps, its recovery cannot deal damage and so is a bit easier to interrupt (plus it cannot fight off edgehoggers at all), and its counter move (Double Team) is too slow to be useful, and the counterattack can even be shielded. Lucario is the epitome of risk versus reward. Its aura rewards it for falling behind and punishes it for pulling ahead, encouraging close matches and come-from-behind victories. In team play, the strength of Lucario's aura is based on the amount of stocks it has compared to all of the other players, including its teammates. The aura grows stronger when Lucario has less stocks than everyone else, and weaker when it has more. A Lucario can be at very high power if it has only one stock remaining but its teammate has three. The stock count and high damage can combine to provide maximum power to Lucario's aura. This phenomenon is known as the Anubis combo. In doubles matches where the Anubis combo is exploited, the Lucario is usually the aggressor, dealing high amounts of damage and knockback as the aura grows stronger after losing stocks, while the other player camps and avoids combat, holding onto their stocks for as long as possible. Mew2King (Meta Knight) and Trela (Lucario) were a notorious team at SKTAR that utilized this strategy, winning the doubles tournament after being knocked into losers' bracket. 3% Lucario waves its hand forward, does a palm thrust, and then kicks high. Both the 2nd and 3rd hit moves Lucario a bit forward. The first hit can be jab cancelled, allowing Lucario to combo into a grab or a tilt. 5% (hit 1), 6% (hit 2 body), 8% (hit 2 arm) Lucario puts its paw forward and creates two small blasts of blue aura. Can be aimed up or down. 6% Lucario swings its leg in an arc over its head. Can be used to juggle opponents at low percentages. There is a sweetspot at the tip of its foot that deals slightly more knockback. 7% Lucario thrusts its leg forward while crouching, similar to Ganondorf's down tilt. 10% (clean), 7% (late) Lucario slides one leg forward on the ground, hitting low. Aura is not involved in this attack. 14% (arms), 16% (blast) Lucario fires a small burst of aura forward. At 170% and fully charged, it has the fourth largest knockback out of all forward smashes in the game. 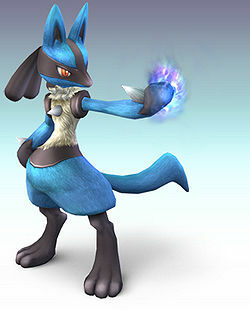 13% (clean), 9% (late) Lucario holds its paw above its head and fires a burst of aura upwards while spinning in place. Great move to use below platforms like Battlefield as the hiboxes are above Lucario and can damage opponents who are close to it. 14% Lucario crouches and then fires two bursts of aura on either side. At 170% and fully charged, it's one of the most powerful down smashes in the game. 11% (clean), 7% (late) Lucario extends both of its hands with blue energy, and spins. It has long ending lag in the air, but minimal landing lag along with almost no startup. Great for setting up another attack after landing on the ground due to the minimal lag, but can only be done at low percentages. 5% Lucario kicks forward in a slight upwards tilt. It can hit twice in one short hop and can always hit another time if an enemy is hit with the first one. 12% (clean), 9% (late) Thrusts its arm behind itself, releasing aura. It has great horizontal knockback along with a large hitbox with good horizontal reach. One of the strongest back aerials in the game if Lucario is at full power. 10% Thrusts its leg upward. One of the strongest up aerials in the game, knockback-wise, when Lucario is at full power. 8% (both hits) Stomps downwards twice powered by aura. When the move is started, it halts Lucario's momentum in the air. 1% Sends an instant pulse of aura into its opponent. Very fast. 10% Uses aura to blast opponent forward. Good horizontal knockback at higher damages and is Lucario's fastest throw. 10% Throws opponent backwards onto the ground. Aura is not involved in this attack. 1% (hit 1), 5% (throw) Performs an uppercut, throwing the opponent upwards. Can chain throw heavyweights and fast fallers at very low percentages. 10% Holds the foe over its head, then slam them to the ground. Aura is not involved in this attack. Can set up an aerial combo at low to mid percentages quite effectively, becoming less effective at higher percentages. 6% Spins around while getting up, kicking on one side, and punching on the other. Aura is not involved. 6% Spins around while getting up, kicking both sides. Aura is not involved. 5% Gets up and kicks both sides. Aura is not involved. 8% (aura), 6% (body) Quickly gets back on the stage, attacking with a burst of Aura. 10% Slowly climbs onto the stage while bringing its feet over its head and then kicks. Aura Sphere 1% (charge), ≈18.75% (fully charged) A chargeable aura blast. Increases in size and deals more damage the more damage Lucario has. Force Palm 10% (aura close), 9% (aura mid), 8% (aura far), 13% (throw) Fires a burst of aura in front of itself. If the opponent is close to Lucario, the move acts like a grab, with it blasting the foe with aura at point-blank range. ExtremeSpeed 0% Lucario launches itself in a predetermined direction. It is possible to change directions during the dash, as well as being able to wall cling if Lucario comes in contact with a wall, making it a very useful recovery move. Double Team 11% Lucario poses, which acts as a counterattack. If Lucario is attacked, it will disappear and counter with a sliding kick from the left or right (depending on the direction the analog stick is held in). Aura Storm 6%/15% (startup), 1% (hits 1-31), 10% (hit 32) (47%/56% total) Lucario flies to the top of the screen in the center of the stage and then shoots a powerful beam attack. If Lucario at 170%, it deals 78% damage and is a one-hit KO against most characters. Lucario enters the stage, gathering aura in its hands as it slowly falls to the ground. Up taunt: Rises into the air, growls, and blue aura is emitted from its body. Side taunt: Moves its paws and puts one forward, and blue aura is emitted from that paw. Down taunt: Takes a martial arts stance similar to Link's down taunt. Moves its arms in a circular motion. Lu-ca-ri-o! Ru - Ka - Rio! Lucario grunts, similar to its up smash. Up: Says "The aura is mine" and slowly clasps two of its paws together. Left: Says "Behold the aura" and does a crane-like stance. Right: Faces to the right with its palm out in front of it and growls. Lucario has a good matchup spread. It is countered by 2 characters, soft countered by 8, has 7 even matchups, soft counters 7, counters 11, and hard counters 1, which is Ganondorf. Lucario's strong air game gives it an advantage against characters like Pikachu. Lucario also counters more low tiers than even some top tiers. However, it has a hard time competing with the top tiers, particularly Meta Knight and King Dedede (the latter is below him on the tier list). For example, King Dedede's defensive prowess walls Lucario out, not to mention he can chaingrab Lucario. Lucario has very solid matchups overall. Azen - While more famous for his Melee dominance, was considered one of the best Brawl players in the United States from 2008-2009, and was a major force in the development of Lucario's metagame. Junebug - Although better known in Project M, was considered one of the best Lucario players in Brawl, most notably defeating Mew2King at KTAR 6 and DEHF at MLG DC 2010. Ksizzle - Mained Lucario along with Meta Knight, and was one of the most dominant players in the United States in 2009-2010. Lee Martin - Mained Lucario along with Meta Knight, and was considered one of the best players in the United States during the MLG era. Trela - Considered the best Lucario player during his prime, and defeated Mew2King at SKTAR, placing 5th. Zucco - A top Lucario main from the Tristate Area. Lucario has always been one of the prominent high tier characters in Brawl. It was ranked 9th on the first tier list (September 2008). Though it dropped to 14th place on the third tier list (July 2009), players such as Junebug, Trela, and Lee Martin gained great tournament results with Lucario, allowing it to be able to maintain a position around 11-12th since then. Lucario is currently ranked 11th place in the upper-mid tier, in the eighth and current tier list, as of April 2013. Lucario plays a supporting role in the Subspace Emissary near the climax. It mostly interacts with Meta Knight. Meta Knight is making his way up a snowy mountain with the Ice Climbers in pursuit. Meta Knight is trying to catch the Halberd which has flown overhead. At the top, he encounters Lucario in a meditative stance on the peak of the mountain. Lucario challenges Meta Knight and the two fight, as the Ice Climbers nervously watch on. After the battle, the victor revives the other from their trophy state. The pair deem each other worthy and shake hands, making an alliance. Suddenly the Halberd slams the Great Fox into the mountain, and Lucario and Meta Knight board it whilst the Ice Climbers are knocked off the mountain into the valley below. After managing to get onto the Halberd, the two pass by Snake, who is hidden in his box. Lucario, being the only one who notices something suspicious about the box, uses its aura to peer into it. Seeing Snake huddled inside, Lucario removes it, and Snake realizes that his cover is blown. Meta Knight draws his sword, but just as he and Snake prepare to fight, Lucario steps in, having sensed a mass of Primids approaching, and the three team up to fight through. Not long after, the trio meets up with Zelda and Peach as their trophies are cloned by the Shadow Bugs. Once the clones are taken care of, Snake, Lucario and Meta Knight discover that the Halberd bridge is being piloted by a group of Mr. Game & Watches. The three of them knock all of the Mr. Game & Watches out of the window, where they land near Peach, Zelda (disguised as Sheik), and Fox who have gathered on the deck of the ship. The Mr. Game & Watches then revert into Shadow Bugs, which fuse into Duon. Lucario and Snake leap from the bridge to the aid of the trio already there, and they are joined by Falco, who skydives from his Arwing. They battle and defeat the monster, who collapses into wrecked metal, Shadow Bugs, and Mr. Game & Watch's trophy. Peach revives him, and he subsequently joins the player's party. Meta Knight, with the Halberd once again in his control, steers his vessel into brighter skies. Lucario is later selectable in the Entrance to Subspace level and is present when Tabuu turns all characters back into trophies. The player must find its trophy in one of the Subspace levels, then they may choose it as part of their team for the Great Maze and for the fight against Tabuu himself. Event 22: Monkeys Unite: As Diddy Kong allied with a giant Donkey Kong, the player must defeat Sheik and Lucario on Rumble Falls. Event 25: The Aura Is With Me: As Lucario, starting at 182% damage, the player must defeat Sheik and Ness on Spear Pillar. Event 39: All-Star Battle x2: Lucario is one of the eight opponents fought in this event along with King Dedede, Ike, R.O.B., Toon Link, Snake, Sonic, and Wolf. Co-Op Event 10: The R.O.B. 's of Tomorrow: As Lucario and the Ice Climbers, both players must defeat five R.O.B.s of varying sizes on Summit. Lucario's main and Final Smash trophies can be obtained by clearing Classic Mode and All-Star mode respectively with Lucario. Lucario's Final Smash. After flying off the screen, Lucario reappears in its center. He then launches a powerful Aura attack against all foes within a certain distance. The key to this attack is the ability to change its angle—it's a must to sweep slowly left and right to hit selected enemies multiple times. The last blow will send the victim flying away. Lucario is one of only three characters in Brawl able to perform three aerials in one short hop (in Lucario's case, rising forward aerial, two down aerials), the others being Meta Knight (three up aerials) and Luigi (rising forward aerial, forward aerial, then neutral aerial or up aerial). Lucario and the Pokémon Trainer are the only characters in Brawl that have a different dubber in every language. When dashing, the first few frames of Lucario's animation seem to look like it is levitating. 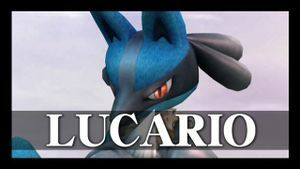 In Brawl, Lucario is voiced by Bill Rogers, who also plays the role of Brock in the Pokémon anime series and other Lucario in the fourth generation seasons. In Japanese, it is voiced by Daisuke Namikawa, who voiced Lucario in the original Mystery of Mew movie. In Spanish, Italian, and German versions of Brawl, Lucario's standard grunts from Bill Rogers are kept, while any spoken dialogue is done by different voice actors. Oddly, the French version does not follow this rule. If Lucario is at above 170% and is behind by two stocks, its forward smash will become the most powerful in the game, with even more knockback than King Dedede's. Lucario has the highest traction of any character in Brawl. Lucario is the only playable Pokémon in Brawl that is not from Generation I of the Pokémon series. In a Miiverse post that accompanied the pic of the day that confirmed Lucario for Super Smash Bros. 4, Masahiro Sakurai stated that Lucario barely made it into Brawl. Lucario is the first Pokémon to be speak English in a Smash game. It was a common theory around the time of Brawl's release that Lucario "replaced" Mewtwo from Super Smash Bros. Melee, due to them having a similar neutral special and similar attributes. However, leftover data on Brawl's disc shows that both Mewtwo and Lucario were both meant to be playable in Brawl. A similar thing happened to Ike and Roy. Not counting Melee, Lucario is the first playable Pokémon character whose onscreen appearance does not involve it being released from a Poké Ball. This page was last edited on March 16, 2019, at 23:09.